I am with ya! I am loving yellow & gray right now too! Love indeed! I love that gallery wall! Well, I love grey and yellow too! Love this color combo! One of my faves! Love everything about this pic! Interesting choice to have the bed off center to the gallery wall. I'm dying to see the other side of this room. I am in love! Seeing this combo in some shape or form everywhere, but this is the best yet! Tiffany I see what you mean. This one pic says alot. I love the color combination. I'm actually going to use it in my bedroom! Thanks for the inspiration! By the way, sending you the pics of you and Mr. Goodwill Hunting, so be on the lookout! 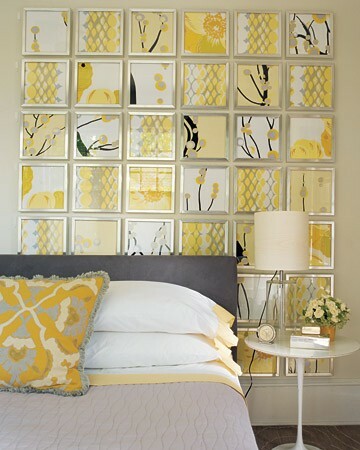 Ooo, I am LOVING pops of yellow! Great color combination. The gallery wall is wonderful...so much texture.